Mouse driven. Click anywhere on the game play field to fire or summon spells. Use the spell book in the in-game settings to equip spells and items. Key board hotkeys 1-4 enabled for advanced players. Castle Volcsum has been invaded by the Evil Horde. 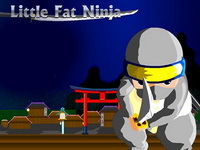 It's up to you (the Little Fat Ninja) to rid the castle of these fiends and restore order to this once happy place. Head back to Arkandia and conquer the Archmage’s Challenge using the all new Enchanting skill. Tons of new dungeons and battles await along with all new loot and spells, explore the deepest darkest dungeons yet while searching for new furniture to swipe to decorate your own house. Create your own custom made magical items using the enchanting skill or seek out legendary artifacts.